Starting from K3, i-Learner’s Love to Write course takes students right the way through primary and secondary school, and develops key writing skills in a wide range of styles. Students will come to enjoy writing in English as they explore all the skills needed to be a confident writer. At lower levels, Love to Write students will transfer their creative thoughts onto the page as they participate through a range of fun, stimulating writing activities. As they progress through primary school, students will gradually pick up increasingly advanced writing skills, and will develop into skilled and mature writers ready to take on the challenges of secondary school assignments. One of the most challenging skills for students moving from kindergarten to primary school is the ability to take their ideas from spoken to written language – especially being able to write in coherent, well-structured sentences. The skills needed for this are developed with great care and attention through our Love to Write course. Lessons start with engaging warm-up activities that aim to capture students’ active imaginations and help them brainstorm ideas. They will then be led to write short fictional stories or descriptions based on their own thoughts or those of the group. Our teachers ensure that students learn to correctly apply the grammar constructions relevant to their level to create simple yet well-written stories, always encouraging students to express their creativity. Knowing how to apply their imagination while using correct grammar and syntax is an invaluable skill in primary school; the Love to Write courses are designed to provide our kindergarteners with a solid foundation to ease their progression into primary level, and for success in their future studies. Across the six years of primary school, the focus of our Love to Write course ranges from simple fiction assignments to multi-lesson pieces of extended writing that really let our students’ creativity flourish and effectively develops their writing skills. Classes are typically comprised of warm-up activities, in which students and teachers share ideas, vocabulary, and writing techniques that are suited to the particular writing topic of that class. 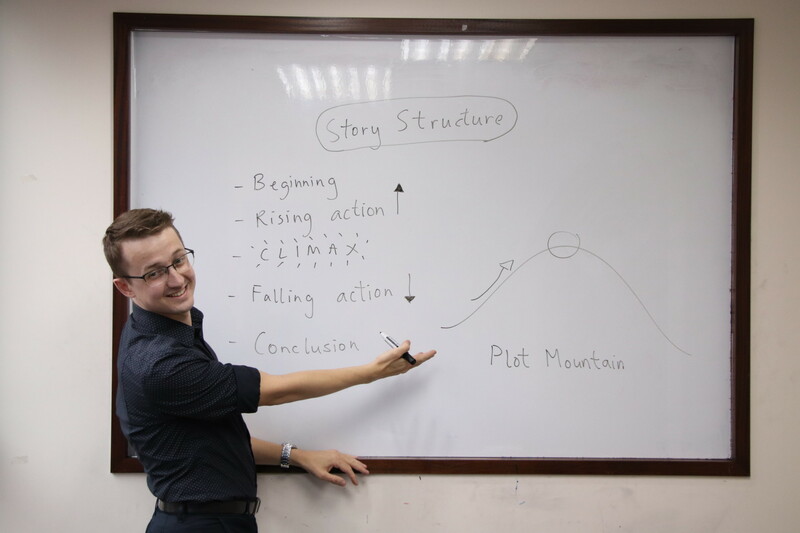 The teacher provides further guidance throughout the students’ writing process to ensure that they are correctly using grammatical structures that they will have learned in school, as well as using the most relevant writing techniques to present their ideas in the best way possible. Writing techniques that typically come into the spotlight in the primary Love to Write courses include dialogue, setting and character descriptions, personification, onomatopoeia and describing by ‘showing, not telling’. As students move into secondary school, we are aware that the focus on writing tends to intensify in class, and that students often need more support to maintain strengthen their English-language writing skills. Our Secondary Love to Write course guides students to polish the skills that they learned in primary school, while also developing more advanced techniques that they can apply to their work at secondary school. Students will not only acquire the ability to make their creative writing ‘jump’ off the page, but will also turn their attention to a wider range of functional writing. This includes becoming skilled at understanding audience and tone, and developing a strong grasp on how to use language for their desired effect. The skills and techniques covered in our Secondary Love to Write course are directly applicable to higher Secondary exams such as the DSE, GCSE, A-levels and IB.